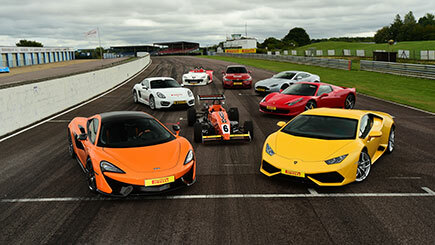 Tickle that need for speed with the ultimate driving day at Thruxton, the UK's fastest circuit. The sensational experience sees guests ride with Tiff Needell as well as taking the helm of an impressive one million pounds' worth of world-class machinery. After demo laps, get to know the track at the wheel of a Porsche Cayman for three laps before sampling three uniquely brilliant supercars. Drive the Ferrari 458 Spider, Aston Martin V8 Vantage N430 and McLaren 570S for four laps each, and strap into a super-fast Formula Renault for five laps to complete over 45 miles of driving! Ride as a passenger in a Peugeot Cup Car for two laps, before finishing on a high with a three-lap ride in a BMW M4, driven by Tiff. Unforgettable! Selected weekdays and Saturdays. A £10 premium applies if you choose to book on a Saturday. Dates fill quickly, so please allow at least six weeks advance booking notice. Available to book from January 2018. Minimum age is 17. Minimum height is 5'1 and maximum height is 6'5''. Maximum weight is 18 stone. A disclaimer MUST be signed confirming you hold a full British or international driving licence and are fit enough to participate. Lasts approximately four and a half hours, including a briefing, demo laps, over 45 miles of driving, two high-speed laps in the Peugeot Cup Car and three laps with Tiff. Please arrive a few minutes in advance of the booked start time. Briefings are shared, however, all in-car tuition is held on a one-to-one basis with a qualified instructor. Thruxton is the fastest circuit in the UK and a fully licenced FIA venue. All instructors are ARDS qualified. Drive the full 2.4 mile circuit on the day. Please call the venue on 01264 882222 if in doubt about the weather.